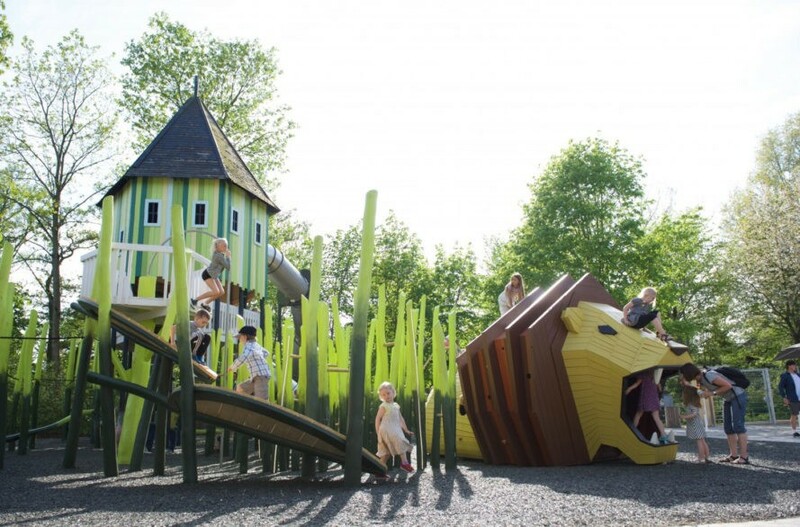 In our safety-first society where our playgrounds are becoming too dumbed-down and simple in the name of protecting our kids, we'd like to present several awe-inspiring alternatives created by Danish company Monstrum. Founded in 2003, Monstrum makes some of the world's most creative and inspiring playgrounds, drawing from nature, culture, transportation, books, and more. The playgrounds encourage kids to use their imagination while moving their bodies, and we love that each design also promotes open-ended exploration; there's no "right" way to approach the structures, which means kids can enjoy them again and again. In each and every one of Monstrum's playgrounds, there are elements for climbing, sliding, balancing, observing, and basically every other activity you would want your child to have an opportunity to do while outside. Far from being too simplistic and babyish, these well-constructed and carefully designed and crafted structures present age-appropriate challenges that promote independence and confidence and are likely as appealing to parents as to kids. Luckily, many of them are big enough that you too can join in! With a keen eye on gently promoting learning through play, Monstrum turns playground spaces into interactive art. As if that weren't enough, the company shares 10% of their profits with a variety of social development causes, distributes another 10% of the profits among the members of the company, and uses FSC-certified, sustainably grown woods. Read on for eight examples of Monstrum's masterpieces! The playground at the Odense Zoo is, as to be expected, pretty wild. Kids can step into the mouth of a hungry lion and be transported to the African savannah. If they make it out in one piece they can climb up to the hut/lookout and then slide down one of two large slides to start playtime all over again. There are also giant blades of grass to maneuver and giant leaves to climb up. For little ones, there’s a kid-sized tour bus (because “driving” the bus never ever gets old to our tots) as well as plenty of sand to play around in and a little, ground-level castle. 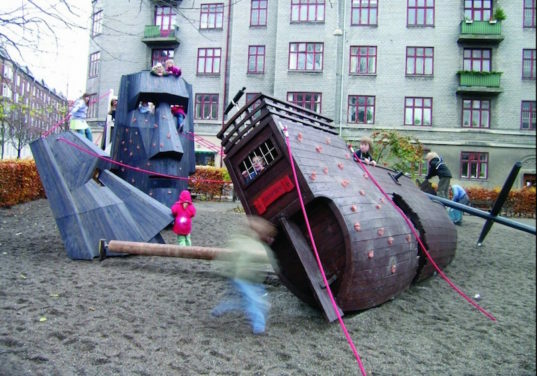 If we ever take our kids to Gothenberg, Sweden, we are totally going to partake in the amazing fun at Liseberg playground (you can see the structure’s front in this post’s last photo). Crafted to include giant multilevel bird cages connected by bridges and featuring red nets that beg to be climbed, the airy structure is also flanked by two 60 foot slides! In a nod to the family who bought the Liseberg site and who also brought dahlias to Sweden, dahlias can be found on the rear exterior of the palace’. There’s also a small rosebud carousel! Built in Bermuda in 2014, the Eel and the Lighthouse playground is located adjacent to the National Museum of Bermuda. Perhaps running around at this playground will burn off some energy and get little minds ready to learn about Bermuda’s history. The only problem? No kid will want to leave this imaginative space, which features a replica of an actual landmark lighthouse located on Bermuda’s St. David’s Island. Entering the eel playspace is made easy through multiple points (including its mouth!). And escape is always possible through the lighthouse slide! 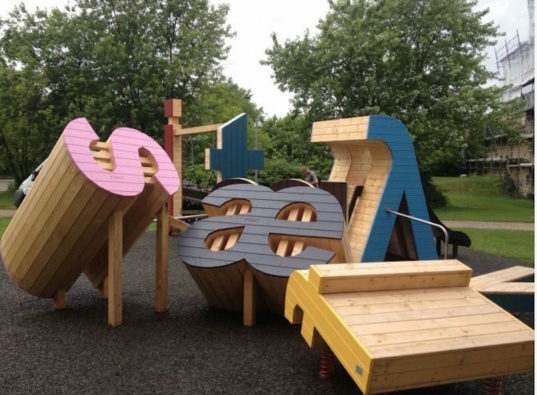 The alphabet playground may not be as grand or complex as some of their other structures, but we love the way Monstrum literally plays with oversized and colorful letters to turn them into a fun activity and climbing space. An upside down “y” forms a playhouse, and all of the letters are at interesting and challenging angles for kids to climb, balance on, and explore. A few of the letters even bounce on springs! Appropriately, the alphabet garden is located next to a library. Nestled in the city of Denmark, the Santa Maria and the Easter Islands make a walk in the park into an all-day activity. Imagining that Marco Polo’s ship has wrecked on the Easter Islands, Monstrum created a leaning, broken ship that doesn’t have a single horizontal surface. Everything is meant to be climbed upon (including the fallen mast), and the slanted surface adds to the challenge. Ropes connect the Easter Island head with the ship, or kiddos can try their balance while moving across a rolling log. It’s not just the climbable front of the Easter Island head that is cool and interactive; the back has two levels of balconies and a slide from the second story. The Tower of Copenhagen Playground was chosen as the city’s Best Children’s Experience, and it’s not hard to see why. 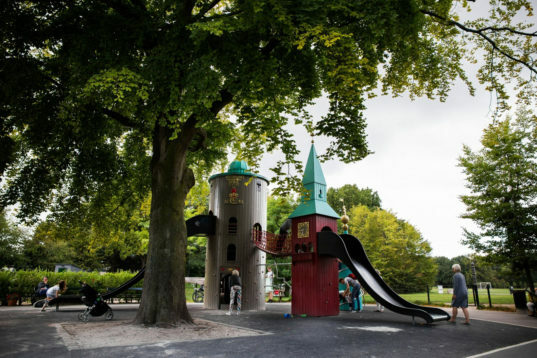 Inspired by some of Copenhagen’s most famous buildings, there are also slides, rope crossings, and several structures for little ones to explore. Designed to get children interested in the local history, kids will also be challenged by numerous climbing opportunities and get to experience the views for high perches. There’s even a small planetarium! Hmmm… which to do first: scooch inside the whale’s ribs and into his belly, or use the hand and footholds to literally climb your way up the whale’s side? Whichever way you choose, adventure awaits at the sperm whale playground in Denmark. Kiddos can admire (and learn from) the drawings depicting the whale’s insides on the structure’s interior while imagining what it would be like to actually be swallowed by a whale (like Pinocchio). For older kids, there’s even a rope to swing across to safety, although anyone can also take the double slide off the side. 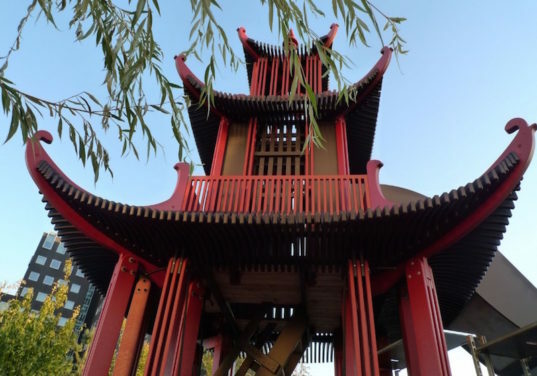 Located at the Tivoli Hotel and Congress Center but accessible to citizens of Copenhagen in addition to hotel guests, the Japanese Tower is a three-story high climbing structure that pays homage to a tower built over one hundred years ago. 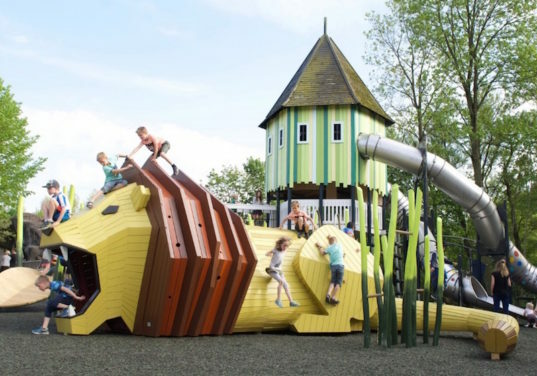 Monstrum redesigned the tower to make it more play-friendly, but the company still showcases the original pagoda design and uses wooden apron planks to evoke the feeling of a naturally-inspired structure. Next to the tower, Monstrum also built three cupolas with lots of bars, steps, and opportunities to climb and hang. 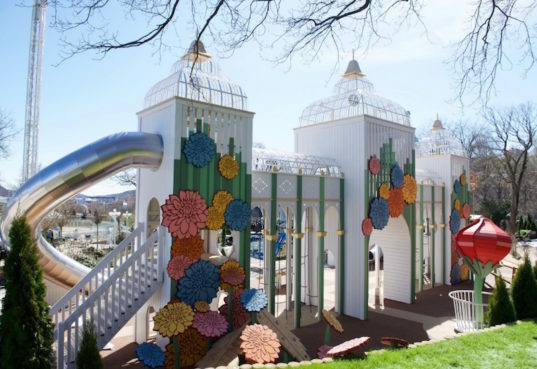 If we ever take our kids to Gothenberg, Sweden, we are totally going to partake in the amazing fun at Liseberg playground (you can see the structure's front in this post's last photo). Crafted to include giant multilevel bird cages connected by bridges and featuring red nets that beg to be climbed, the airy structure is also flanked by two 60 foot slides! In a nod to the family who bought the Liseberg site and who also brought dahlias to Sweden, dahlias can be found on the rear exterior of the palace'. There's also a small rosebud carousel! 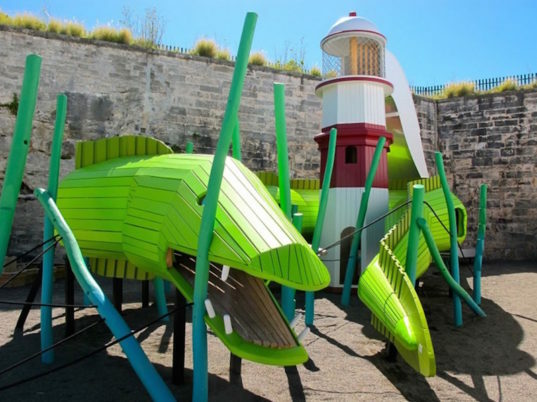 Built in Bermuda in 2014, the Eel and the Lighthouse playground is located adjacent to the National Museum of Bermuda. Perhaps running around at this playground will burn off some energy and get little minds ready to learn about Bermuda's history. The only problem? No kid will want to leave this imaginative space, which features a replica of an actual landmark lighthouse located on Bermuda's St. David's Island. Entering the eel playspace is made easy through multiple points (including its mouth!). And escape is always possible through the lighthouse slide! The alphabet playground may not be as grand or complex as some of their other structures, but we love the way Monstrum literally plays with oversized and colorful letters to turn them into a fun activity and climbing space. An upside down "y" forms a playhouse, and all of the letters are at interesting and challenging angles for kids to climb, balance on, and explore. A few of the letters even bounce on springs! Appropriately, the alphabet garden is located next to a library. Nestled in the city of Denmark, the Santa Maria and the Easter Islands make a walk in the park into an all-day activity. Imagining that Marco Polo's ship has wrecked on the Easter Islands, Monstrum created a leaning, broken ship that doesn't have a single horizontal surface. Everything is meant to be climbed upon (including the fallen mast), and the slanted surface adds to the challenge. Ropes connect the Easter Island head with the ship, or kiddos can try their balance while moving across a rolling log. It's not just the climbable front of the Easter Island head that is cool and interactive; the back has two levels of balconies and a slide from the second story. The Tower of Copenhagen Playground was chosen as the city's Best Children's Experience, and it's not hard to see why. Inspired by some of Copenhagen's most famous buildings, there are also slides, rope crossings, and several structures for little ones to explore. Designed to get children interested in the local history, kids will also be challenged by numerous climbing opportunities and get to experience the views for high perches. There's even a small planetarium! Another view of Monstrum's The Towers of Copenhagen playground. Hmmm... which to do first: scooch inside the whale's ribs and into his belly, or use the hand and footholds to literally climb your way up the whale's side? 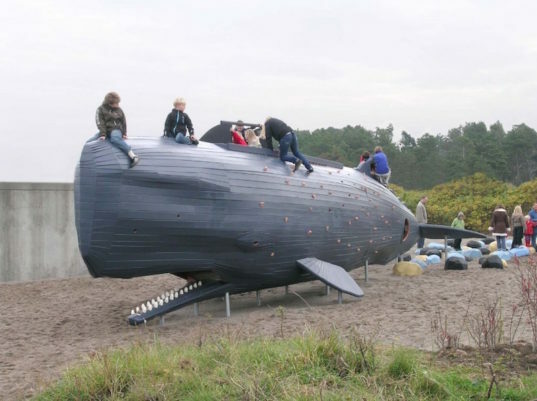 Whichever way you choose, adventure awaits at the sperm whale playground in Denmark. Kiddos can admire (and learn from) the drawings depicting the whale's insides on the structure's interior while imagining what it would be like to actually be swallowed by a whale (like Pinocchio). For older kids, there's even a rope to swing across to safety, although anyone can also take the double slide off the side.